The Ganges River dolphin or Susu, lives in one of the most densely populated regions of the world. One of the main threats to the species is loss of habitat due in large part to the creation of dams and irrigation projects. The Ganges River dolphin, or susu, inhabits the Ganges-Brahmaputra-Meghna and Karnaphuli-Sangu river systems of Nepal, India, and Bangladesh. This vast area has been altered by the construction of more than 50 dams and other irrigation-related projects, with dire consequences for the river dolphins. The Ganges River dolphin lives in one of the world's most densely populated areas, and is threatened by removal of river water and siltation arising from deforestation, pollution and entanglement in fisheries nets. In addition, alterations to the river due to barrages are also separating populations. A recent survey conducted by WWF-India and its partners in the entire distribution range in the Ganga and Brahamaputra river system - around 6,000 km - identified fewer than 2,000 individuals in India. This dolphin is among the four "obligate" freshwater dolphins - the other three are the baiji now likely extinct from the Yangtze river in China, the bhulan of the Indus in Pakistan and the boto of the Amazon River in Latin America. Although there are several species of marine dolphins whose ranges include some freshwater habitats, these four species live only in rivers and lakes. Plataniste or Ganges river dolphin (Platanista gangetica), Karnaphuli river, Bangladesh. Cetaceans (whales, dolphins & porpoises) are a priority species. WWF treats priority species as one of the most ecologically, economically and/or culturally important species on our planet. And so we are working to ensure such species can live and thrive in their natural habitats. 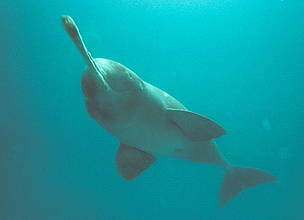 A long thin snout, rounded belly, stocky body and large flippers are characteristics of the Ganges River dolphin. Although its eye lacks a lens (this species is also referred to as the "blind dolphin"), the dolphin still uses its eye to locate itself. The species has a slit similar to a blowhole on the top of the head, which acts as a nostril. The dolphin has the peculiarity of swimming on one side so that its flipper trails the muddy bottom. This behaviour is understood to help it to find food. Being a mammal, the Ganges River dolphin cannot breathe in the water and must surface every 30-120 seconds. Because of the sound it produces when breathing, the animal is popularly referred to as the 'Susu'. The movements of the Ganges River dolphin follow seasonal patterns, although the details are not well known. However, it seems that animals travel upstream when water level rises, and from there enter smaller streams. Females are larger than males and attain a maximum size of 2.67 m. Males are about 2.12 m.
The colour of the dolphin is greyish brown. The calves and young ones are dark in colour but as the animal grows in size, the colour lightens. 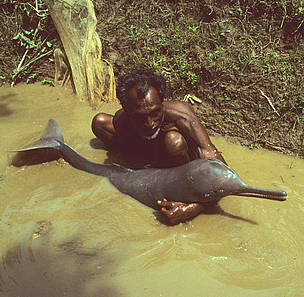 Bangladeshi fisherman with a Plataniste or Ganges river dolphin (platanista gangética), Karnaphuli river, Bangladesh. The species is found exclusively in freshwater habitat. In Nepal, it inhabits clear water and rapids. In Bangladesh and India, individuals live in rivers that flow slowly through the plains. The Ganges River dolphin favours deep pools, eddy counter-currents located downstream of the convergence of rivers and of sharp meanders, and upstream and downstream of mid-channel islands. 'Susu' shares its habitat with crocodiles, freshwater turtles and wetland birds, many of which are fish eaters and are potential competitors with dolphins. In the 19th century, Ganges River dolphins were once found in 'large schools' close to urban centres along the river. Nowadays, groups are considerably smaller, and individuals may also be found alone. 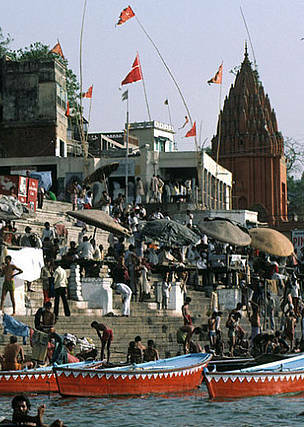 The average size of a number of groups surveyed recently in the Ganges River system was two individuals. The young wean within their first year, and males reach sexually maturity at around 1.70 m (5.6 ft), when they are about 10 years of age. The oldest male animal on record was about 28 years old. The gestation lasts from 9 to 11 months, and one calf is usually born, once every 2 to 3 years. There is no specific birth period, although females usually give birth from October to March, with a peak in December and January at the onset of the dry season. The diet includes a variety of fish and invertebrates, namely prawns, clams, catfish, freshwater sharks, mahseers (except in India), gobies and carp. Ganges River dolphins normally chase surface dweller fishes and grovel mud dweller fishes in shallow water with the help of their long snout. They cannot chew and usually swallow their prey. The presence of dolphin in a river system signals a healthy ecosystem. Since the river dolphin is at the apex of the aquatic food chain, its presence in adequate numbers symbolizes greater biodiversity in the river system and helps keep the ecosystem in balance. During the last century, thousands of freshwater dolphins rolled and jumped in their natural habitat, which once ranged throughout the Ganges-Brahmaputra-Meghna and Karnaphuli-Sangu river systems of Nepal, India, and Bangladesh, from the Himalayan foothills to the Bay of Bengal. In 1982, the population in India was estimated to be between 4,000 and 5,000 individuals. Today, it is difficult to sight a dolphin in the rivers. Extensive modifications of this species' habitat have reduced its once abundant population throughout its range. The distribution in the Ganges has diminished by approximately 100 km (62 miles) since the 19th century, with hundreds of kilometres of tributary habitat lost to irrigation barrages. There has been a concomitant reduction in water flow. Today the population has a much reduced range, and is divided by dams into isolated groups. The lowest estimate for the total population is 1,200–1,800 individuals. Although the population size has decreased compared to historical levels, it is still considered to be large enough to sustain the species in the future if adequate conservation measures are taken soon. What are the main threats to the Ganges River dolphin? The survival of the Ganges River dolphin is threatened by unintentional killing through entanglement in fishing gear; directed harvest for dolphin oil, which is used as a fish attractant and for medicinal purposes; water development projects (e.g. water extraction and the construction of barrages, high dams, and embankments); industrial waste and pesticides; municipal sewage discharge and noise from vessel traffic; and overexploitation of prey, mainly due to the widespread use of non-selective fishing gear. More than 50 dams and irrigation-related projects have had an adverse impact on the habitat of this species. These projects result in major changes in the flow, sediment load, and water quality of rivers, which affects the quality of waters downstream. As a result, there has been a serious decrease in fish production, while the extraction of river water and siltation from deforestation are also degrading the species' habitat. In some cases, habitat alterations have resulted in the genetic isolation of dolphin populations. Pollution levels are a problem, and are expected to increase with the development of intensive modern industrial practices in the region. Compounds such as organochlorine and butyltin found in the tissues of Ganges River dolphins are a cause for concern about their potential effects on the subspecies. Bycatch in gillnets and line hooks is also a major source of mortality for this subspecies. Although the killing of this dolphin for meat and oil is thought to have declined, it still occurs in the middle Ganges near Patna, in the Kalni-Kushiyara River of Bangladesh, and in the upper reaches of the Brahmaputra. In fisheries for large catfish in India and Bangladesh, dolphin oil and body parts are used to lure prey, and Ganges River dolphins are used to this end. Efforts have been made in India to test shark liver and sardine oil and fish offal to find an alternative for dolphin products. The latter appears promising. 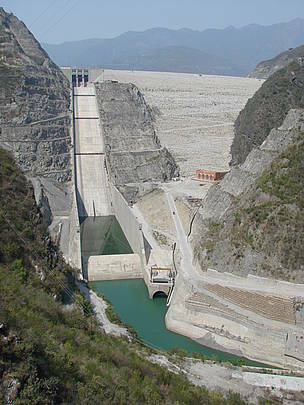 The Tehri dam on the Ganges River, in the state of Uttarakhand, India. The dam became operational in 2005, and is the 5th largest in the world. It is part of a project in which the Indian government plans to link 37 major rivers through a series of dams and canals to provide drinking water and generate electricity. In the WWF's report 'World's Top 10 Rivers at Risk', the Ganges River has been identified as one of the 10 at risk, due to the water withdrawal. 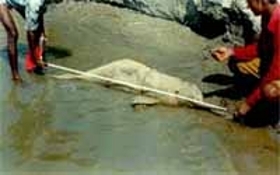 Ganges river dolphin killed as a result of fishing activities. Public awareness and support for conservation of the Ganges River dolphin is virtually non-existent, and although the Wildlife Protection Act of India mandates dolphin conservation as a priority, little has been done at the government level to implement or enforce the law. In 1997, WWF India developed a plan of action for the conservation of the Ganges River dolphin. WWF's objective for freshwater cetaceans is to ensure that habitat degradation and fisheries bycatch do not threaten any species of freshwater cetacean. Specifically for the Ganges River dolphin, WWF aims to reduce or eliminate the threats caused by fisheries bycatch and habitat degradation by 2012. 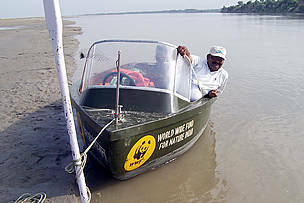 To mitigate the identified threats, WWF encourages local communities along a 164km-stretch of important dolphin habitat in the upper Ganges River to use natural fertilizers; not to dispose of domestic sewerage in the river; to improve sewerage management; to reforest the river bank; and to ban commercial fishing and sand-mining activities. WWF also monitors dolphin populations and threats in important dolphin habitats in other areas of the country. WWF has initiated a project to survey Ganges river dolphin populations in the Karnali River and its tributaries. The project will also analyze threats to the dolphins and their habitats, and provide recommendations to decision and policy makers on dolphin conservation. Awareness-raising activities will also be carried out at a local level. WWF additionally has several large-scale initiatives and projects to address freshwater issues that also affect river dolphins. These include the Dams Initiative, which works to ensure that the benefits provided by dams are not overtaken by negative environmental and social impacts; agriculture initiatives, which work to reduce water use and pollution caused by agriculture; and the promotion of Integrated River Basin Management, which aims to maintain or restore functioning freshwater ecosystems and promote sustainable use of water resources in the world’s major river basins. 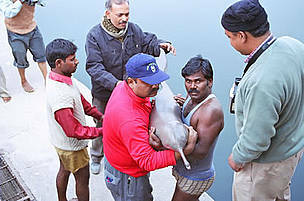 Ganges River dolphin being rescued. Dr Sandeep Behera, WWF-India’s Freshwater Species Coordinator, patrolling for gharials and Ganges River dolphins on the Chambal River. 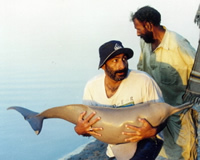 An Indus river dolphin (Platanista minor) being released as part of a dolphin rescue operation in Pakistan. 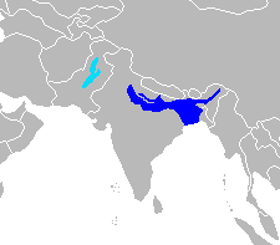 The Indus River and Ganges River dolphins are from the same genus. Indian students rally for the Ganges river dolphin. The dolphin's vision has probably degenerated because of the poor visibility of the waters in the Ganges River.